Do you use a Keurig? Which K-Cup is YOUR favorite??? have probably 75 different flavors...told you I was addicted. Also love Gingerbread and Pumpkin Spice year round..
We don't have one at home, but JC bought one for his office! i love my Keurig! it's the most amazing thing a college kid can have! :) I love love love green mountain coffee kcups. they are fabulous. anything gloria jean is good and i JUST bought some folger's columbian.. I don't personally own one, but I like the pumpkin spice, mudslide, whatever the almond one is, hazelnut and the donut shop one. I know what's kind of vague but the only one I didn't like was some sort of caramel nut thing. They just put tea in the one I use so I'll let ya know how that goes! Don't drink coffee, DH does. He loves this maker! My husband loves his Cuisinart which grinds the beans and makes the coffee! I really want one of those...for now we are rocking it old school style! Are the cups expensive? Thank you for stopping by and your encouraging words! Yes, Pat and I love our Keurig! My favorite is Breakfast Blend by Green Mountain with honey. Pat loves Newman's Own Bold. I don't drink coffee, but I got a Keurig to have for when we have guests over. I also enjoy it for hot tea and hot chocolate. My husband enjoys it when he doesn't want to take the time to perk his coffee in the percolator. I get my coffee on sale at Kohl's and also Bed, Bath & Beyond. My oldest daughter orders her coffee online. Came by your way today on my trip back from Rocky Mount for the weekend. Love & blessings from NC! 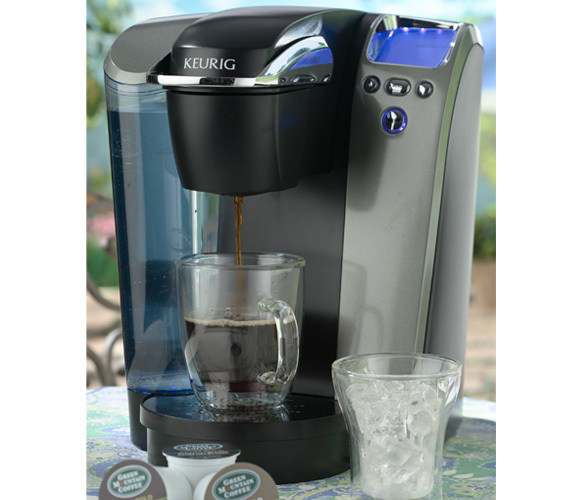 I do not have a Keurig, but I have used them and think they are wonderful! For now I continue drinking coffee made by my trusty Braun coffee maker. I like reading everyone's favorite flavors though. What is yours? I bought the filter for mine that I can put any coffee in. so now I just buy the Starbucks/Dunkin Doughnuts coffees I like for it. It's less expensive too! I love my Keurig. My favorite coffee is Gloria Jean's Hazelnut. If you want a good decaf: Timothy's Decaffeinated Columbian and Green Mountain Coffee Hazelnut Decaf are both good. Trying a new one this week: Green Mountain Island Coconut! I also make my hot tea in the Keurig by putting any teabag in the little filter and brew it, then put the bag in my cup to give it a bit more flavor. Hot tea in seconds!! We have one and used it a ton in the beginning. We've sort of fallen off lately but that's because my husband got some Starbuck's cards for Christmas and those were more enticing apparently! He likes the Donut Shop one. Some of the flavored ones are a little weak if you prefer a stronger coffee. I'm going to have to try the filter that one of your readers mentioned. Just got mine for Christmas and LOVE it. I only drink 2 cups a day...one regular and one decaf. I like the Van Houtte French Vanilla to start the day and then follouw up with Green Mountain Decaf. Add 1T of Coffeemate French Vanilla...Yum! We've been at our time share in Palm Desert for two weeks, so I haven't been on the computer much at all...very unlike me! We're actually in LA tonight and will fly home early tomorrow morning. I'm letting George watch sports on tv so I can catch up on my blog reading! LOL I've had fun catching up with you this afternoon. So many cute photos of your littles! I love my Keurig too. I don't like my coffee too strong. My fav is Grove Square light roast (I found it at Walmart!). Wordless Wednesday With The Grands!